Holy crap. I did it! 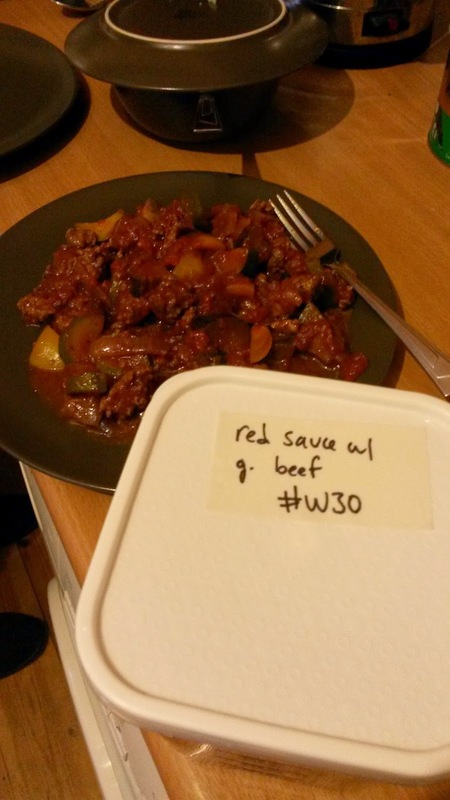 I made it to Day 15 of my #whole30 challenge. Today was a bit weird though as I kept craving nut butter-covered banana. I first enjoyed this amazing treat yesterday. 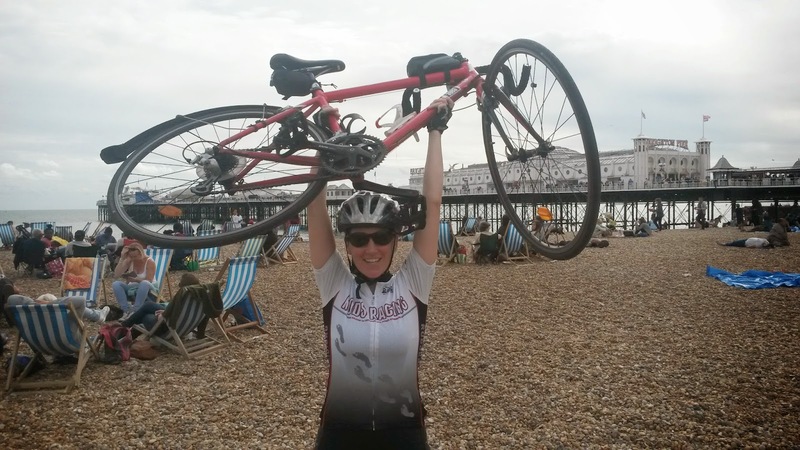 A bunch of us rode 50+ miles from London to Brighton. The weather was perfect for the ride. Sunny with a slight cool breeze. It was a casual pace, taking about 5.5 hours from start to finish. Fueling for the ride made me nervous as I wanted to stick to my Whole30 rules. (Honestly, I get nervous anytime I have to go out into the real world and eat). Before we left home, I filled my water bottles with tap water and juice from 1/2 lime to give it some flavor. My pannier bag contained Urban Fruit (mango and pineapple); dried figs; mix of cashews, almonds, and dried apricots; hard boiled eggs; 2 bananas; almond butter. hold me over til Thursday. First banana I ate at a traffic light as my first snack of the ride. The second I enjoyed at a cheeky pub stop. Everyone else was enjoying crisps and Coke, while I had a pint of tap water and figs. 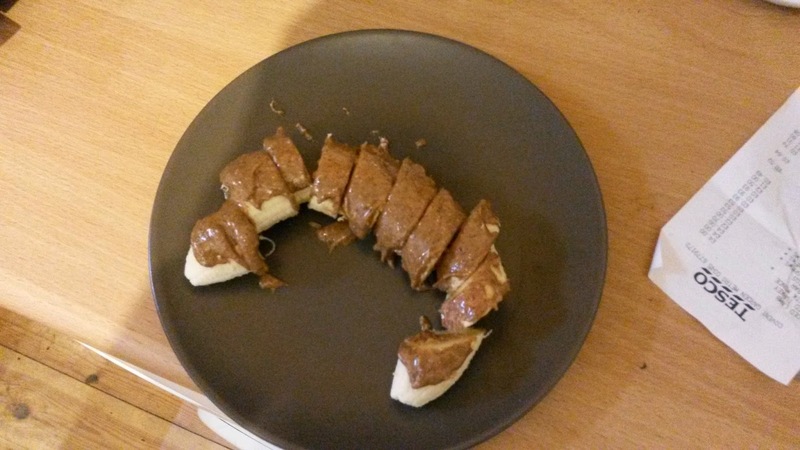 I then had the ingenious idea (late to the party, I know) to dip my banana in the nut butter. My world has changed (but not sure if it is for the good). I ate the Urban Fruit along the way, as well as the nut mix. While everyone enjoyed their fish and chips, I had a hard boiled egg (one went all soft so I didn't dare eat it). 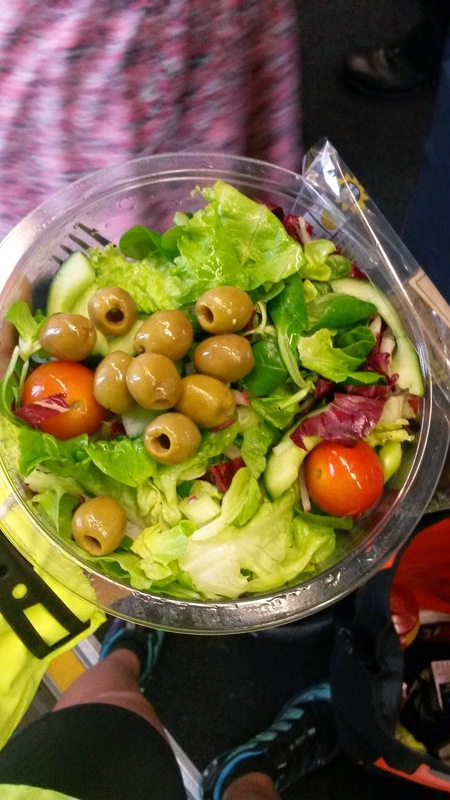 M&S came to the rescue for the train ride home with a house salad and olives. I don't think I could have made it home to my lamb curry without eating my hand off (that is Whole 30, right?). Today was a rainy day, and I took advantage by staying home and cooking up a storm. (Best chicken ever, red sauce inspired by this with ground beef, and curried coconut turkey inspired by nom nom paleo). And all day long, all I craved were these nut buttery bananas. And I ate them. Three of them. I don't know if yesterday's natural sugar-fueled ride has reawakened my sugar dragon. Or I was deficient in nutrients from the ride. Or bored. Whatever the reason, I am disappointed that I succumbed to these cravings (seriously, I have no will power). Tomorrow I will be back at work, with a routine, and no access to the nut butter or bananas. I will go veg heavy tomorrow too to make up for the naughtiness of the last 2 days. I will say I am proud of myself for planning my fuel for a long endurance session without caving in to fish and chips by the sea or bonking. 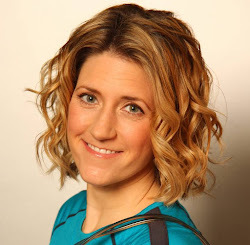 My husband thinks I need to create a #whole30 plan for athletes. Surely there must already be one out there. Do you know of one? awesome work :) ...and almond butter on banana is THE best snack ever! I often have one after a meal....sounds like you just didn't eat enough on the bike ride day?! I'd say a whole30 for athletes is exactly what we are doing...maybe just more food to account for the difference in calorie expenditure?! I think you have to keep it in perspective! I think a few nut covered bananas are a much better choice than most of the traditional recovery foods! I'm on day 4, feel better already! You're doing great!